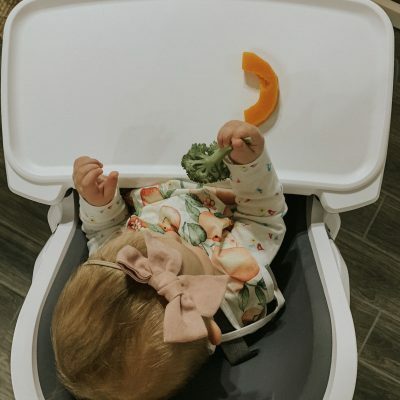 I’ve had countless questions about Norah and her baby-led weaning experience. But something I get asked a lot is how we knew we were ready to start solids and baby-led weaning with Norah. You can read more about why we chose baby-led weaning this time in this post here. It’s been incredible to watch the difference between traditional purees with my first, to trying out baby-led weaning from the start with Norah. Here’s a bit about our experience, and how we got started. After starting way too early with our first child, I knew I wanted to let Norah take her time with solids. I waited for three sure signs that she was ready to try them out. 01. She could sit up unassisted. It’s imperative that baby is sitting on their own. If you try to prop your baby up, it’s kind of defeating the purpose of them being independent/self-sufficient with feeding. Wait until they’re ready! If they can sit up on their own, they can sit in a high chair and probably grasp things at this point too! It’s all connected. 02. She showed an interest in food. Norah started showing an interest in my food around four months. However, I just let her watch me eat (I didn’t feed her any of it) for a good three months before I actually let her taste anything. She couldn’t sit up and she wasn’t old enough yet. Think of it like this – they’re interested in what their parents are eating just like they’re interested in their siblings’ toys. It’s fascinating, it doesn’t mean they’re starving. Many parents see their children/infants watch them eat and think “oh, no, he’s hungry.” Nope. He’s just fascinated by you! Let your baby observe. They learn so much just by watching! 03. She was at least six months old. I like to reference the World Health Organization fact sheet for rules like this, because they aren’t really rules – they’re more like guidelines! I actually didn’t feed Norah until she was well over seven months old. She couldn’t sit up unassisted until then, so I wasn’t in any hurry. But if your baby sits up early and isn’t six months old yet, I truly would try to wait to introduce solids. According to the WHO, parents should “start (solids) at 6 months with small amounts of food and increase gradually as the child gets older”. The American Academy of Pediatrics says the same thing about starting at six months. Read more about the AAP’s recommendations for infant feeding guidelines here. In short: take your time. We waited until we truly thought Norah was ready. Instead of trying it, stressing that Norah didn’t take well to them, and then worrying non-stop. The result was a happy baby who was developmentally ready to take on solid food. It also resulted in a much more relaxing experience for our whole family! 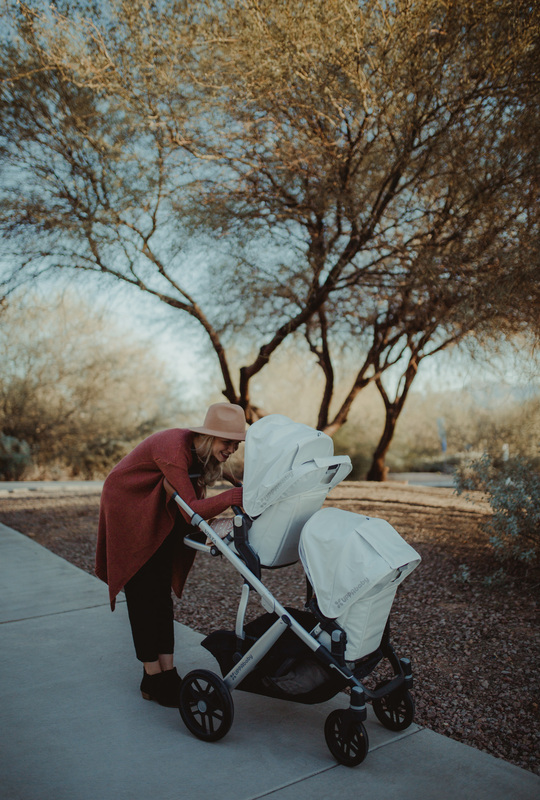 So the most commonly asked question is “how do I start?” Well, once you’ve decided your baby meets all of the criteria above, then it’s time to get started, yay! Here are a few steps I suggest you take. 01. Pick up a high chair. I really liked this book on Baby-Led Weaning. I feel like it prepared me on how to introduce foods and showed me what I should introduce. 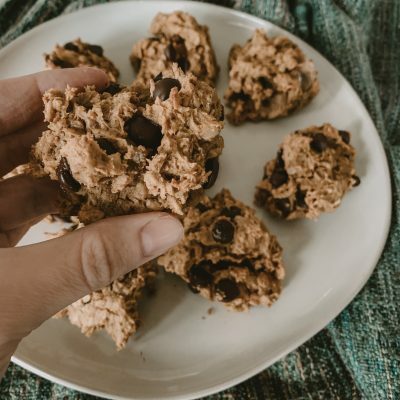 So the goal is for you to easily feed baby what you’re making the rest of the family dinner that night, but for the first few months, it’s about exposing baby to several different types of foods. Therefore, prepping is essential. It really doesn’t take that much extra work either, as they don’t eat a ton in the beginning. I like to make a little mini meal plan. I’ll choose three veggies, three fruits, and three proteins. Then mix and match those for lunches/dinner. As for breakfast, I usually give her fruit or some peanut butter on sprouted bread. We’re simple people around here. I’ll share more meal ideas, but for now, just know – it helps to plan ahead. Next, I’ll share a play-by-play of the first couple of weeks of baby-led weaning. I’ll share how it went. Norah’s first meal, what we fed her, and how she reacted!